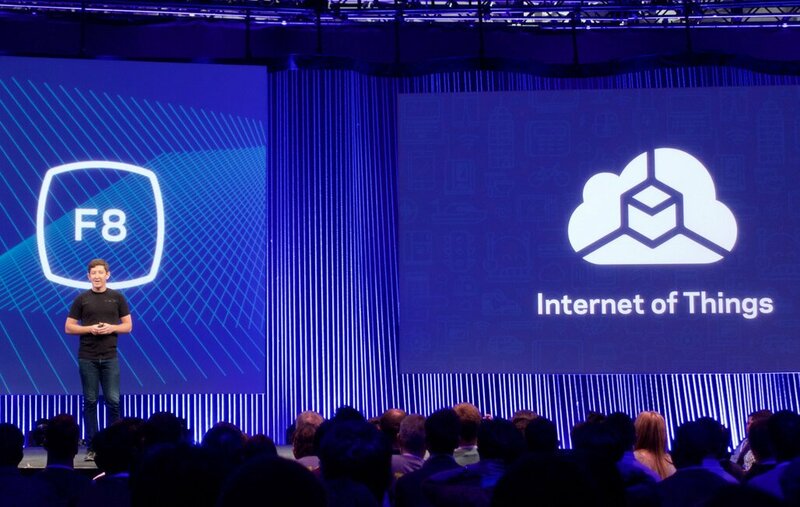 Parse CEO Ilya Sukhar introduces Parse SDK for Internet of Things class of devices at Facebook's 2015 F8 developers conference in San Francisco. Photo: Facebook Inc. If you take an ounce of gold out of a vault in London and go to Tokyo to sell it, you’ll have a surprisingly hard time getting your expected $1200 revenue out of the stuff but you will still be able to fly on a commercial airliner with your goods. If you try the same process, but with 100 ounces of gold, the commercial airliner is going to be out of the question. Now you are talking about hiring a third party shipping company etc. which involves an increased time scale, meaning that you have slowed down your average transaction velocity time. First of all, there’s the issue of the buyer you are looking to source – but that is exactly what the Internet of Things is designed to solve. So imagine a world now where multiple buyers and sellers are matched up on this incredibly powerful network – the Internet of Things – growing at exponential rates, alongside your standard high street commercial bank ostensibly helping finance the increasing volumes of orders. 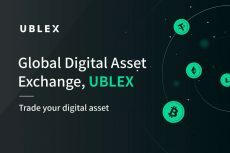 Clearly, it’s impossible – the only thing that is certain about that scenario is that transaction velocity will come to a grinding halt as transaction volumes overwhelm the financial services infrastructure that is in place to support such increases in volume, resulting in a zero-sum game. Since the late 1990s, this has indeed been the case, little by little: think how long you had to wait vs. how much cost you paid for transport for any product off Amazon. It used to a couple dollars a package for a day’s wait; that cost is in some cases five-fold higher now or the wait time is ten-fold higher. The only way to ensure that transaction volume ratio increases are met with equally exponential increases in transaction velocity is to introduce a financial product with a credit mechanism to it (as we understand current credit to be, i.e. non-cash and non-derivative) that can be simultaneously used for purchase, trade, hypothecation and consumption all at the same point of being converted and on a continual basis. 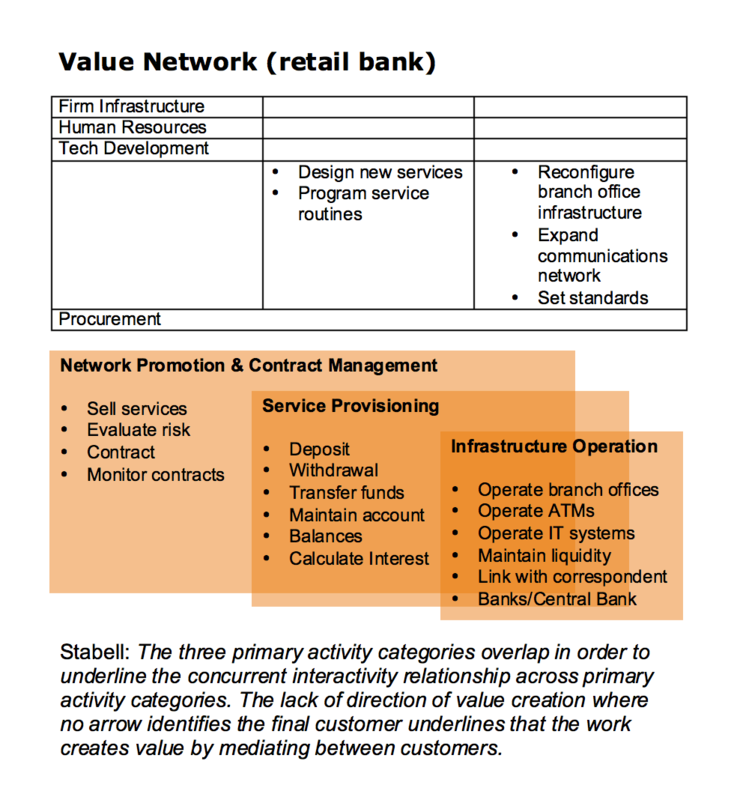 Factory Banking has its roots firmly in the theory of value configuration. Factory Banking is the value configuration by of the blockchain technology, which is to say, it is the specific way in which value is identified as a process within any given blockchain technology. This is not the same thing as saying that Factory Banking is the manufacturing of virtual currency, however, since there are all sorts of possible definitions of virtual currency units. For instance, games such as Second Life (Linden Labs) and World of Warcraft contain a wide range of virtual consumer product items that can be purchased with nominal currencies valid for use within the game. A blockchain is a very specific process by which value is manufactured. That process involves tightly wedding the dominant functions of the three traditional value configurations of industry together. Writing in the Strategic Management Journal in 1998, Profs Charles Stabell and Oeystein Fjelstad wrote a groundbreaking paper which changed the way much of the academic and technology community at the time looked at value creation. In the paper, the professors claimed that models traditionally used to characterize organization types could in fact be more succinctly used to identify specific value creation mechanisms. In the paper, Stabell and Oeystein developed visual diagrammatic models to represent two types of firms other than value chain firms (which buy and sell goods for a mark-down/up). Up until the late 1990’s technologies were considered to be primarily a cost-reductive device that could be used to enhance manufacturing and retail margins, or if not, then increase volume of manufactured goods in a much more efficient timescale (and thereby still deliver an indirect cost-benefit to the employer of the technology. But Stabell and Oeystein pointed out what was then an entirely new and radical observation – specifically, that technologies could be used not just as a cost efficient profit-margin booster but as a rather more knowledge-intesive mechanism. 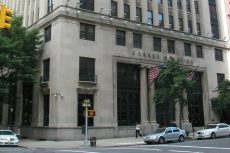 They could for example be used to “resolve unique customer problems”, they wrote, such as when a consulting firm employed sophisticated data analysis software to conduct analyses on what was a scenario resembling a seemingly impenetrable mess of statistics wherein no solution to a problem beforehand could be found. Or they might be used to “enable direct and indirect exchanges between customers,” the authors wrote presciently, given that the internet back then was still in very early nascent stages of adoption. 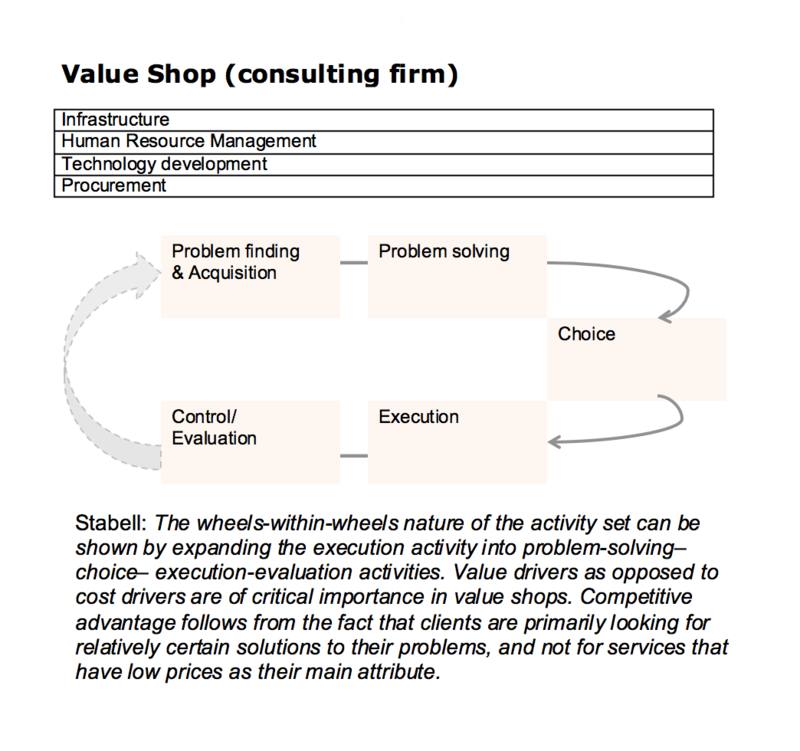 A value shop is one of the value configurations that Stabell and Oeystein identified, and can be defined as any firm that sells knowledge, such as a consulting firm or a data analytics provider. Today, there are so many of these types of companies coming to market that the model seems fairly unexceptional, but that was not the case in the late 90s, when such firms were very cutting edge (it was thought of as strange still back then to charge for something intangible such as advice unless you had to pay for it as matter of regulatory reality, such as legal advise). 1. There’s overlapping process, just as there is in a value network – this is represented in the interaction between the infrastructure and the end-user. It is often commented upon how the Blockchain is so unusual in that it is a network, but it’s one where personal interaction is not required. 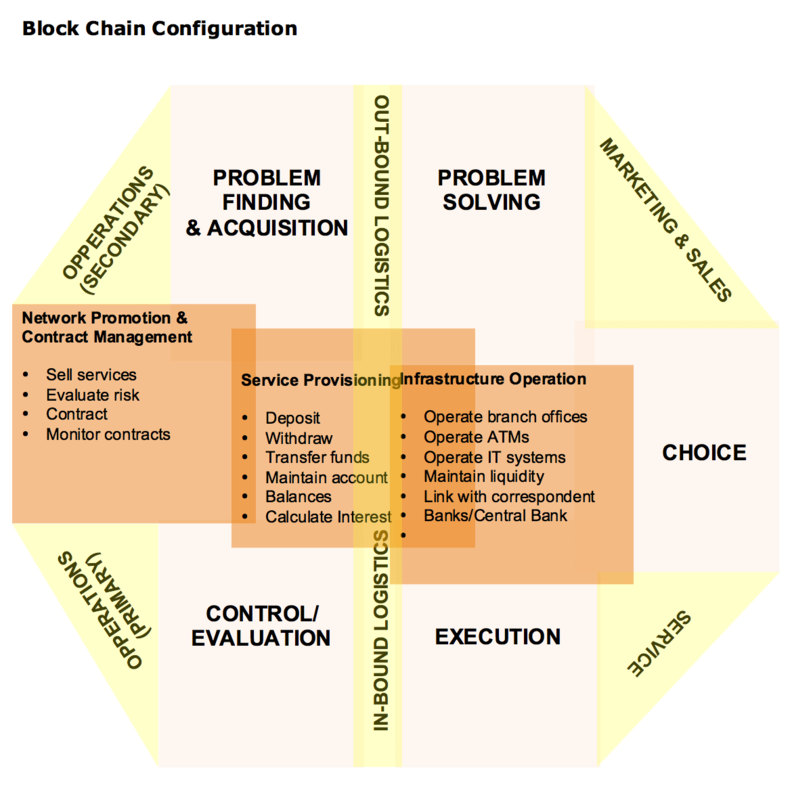 This strange characteristic of the Blockchain is clearly illustrated above as the Network Promotion (exchanges)-Service Provision (wallets)-Infrastructure Operations (coding to improve etc.) being overlapping but at the same time somehow held in place by what is an ostensibly Value Shop-oriented configuration. 2. The second thing to note is that by the virtue of possessing a networked interior, the Blockchain is able to perform independently and deliver the automated Value Shop processes to the end user without having to bring in a middle man. 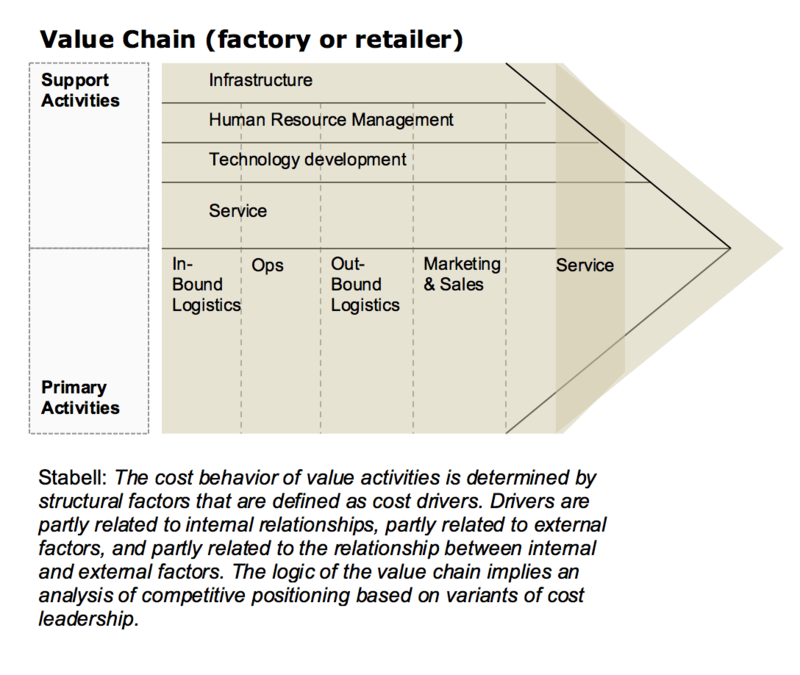 In this way, the value chain processes of in-bound/out-bound logistsics, combined with the operating and service capabilities that the technology delivers, erases the requirement for any of the arrows we saw in the Value Shop model – instead, those processes are bound by the value chain in the block (that is why it is called the “Blockchain, essentially – this is just economic parlance instead of tech-speak, that’s all). Here, we can clearly see that Problem Solving leads to Deal execution – in the Blockchain, this could not be more true; Problem Solving is in fact the way that Bitcoins are created. Equally, the support functions of Evaluation and Problem Finding are automated within the system by the way in which every miner is required to fill in their quota of the “block”. 3. Here is the interesting bit: as a result of performing these automated processes that are usually carried out on an interpersonal level among Value Shop and Value Network participants, the Blockchain realises Bitcoins. 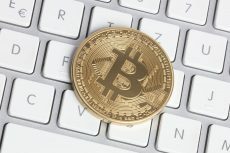 Thus, the picture of the Blockchain itself becomes one of the Bitcoin currency unit that is manufactured in the process of transaction automation. It’s difficult not to get excited about the possibilities inherent here, particularly when you consider that high-volume, high-velocity transactions are exactly what the Internet of Things will be reliant upon if it is to expand beyond the borders of technology and enter the territory of intelligence. Thus, in the instance that the Bitcoin is created, we have two processes taking place (as in the Value Chain): a primary and a secondary process. This time, however, those two processes are reversed, with Sales & Marketing being a byproduct of the issuance of the unit itself. You can put it like this: by performing the service of issuing the Bitcoin unit, the miner’s hardware is able to maintain the service of the platform indefinitely, since the unit can only be issued subject to being authenticated first. That this unit then has a market and sale value all of its own accord is, quite simply, in terms of technological innovation, a miracle. There has been nothing like that in any previous value configuration prior to the blockchain’s invention. For this to happen, processes must be highly connected, they must be automated, secure, and must be adaptive to extreme velocities. Only the Blockchain configuration has the potential to manage such a commercial transition – simply, any other method of financing growth that we have tried up until now would crumble in an environment wherein 2 more major paradigmatically-serious economic revolutions will come about in less than a century from today. Each revolution has its own form of banking, characterising its method of making sweeping changes. Factory Banking is so labelled because of the unique way in which the value issuance and cashier technology – the Blockchain – is also a factory of value. Before this point, manufacturing has always happened separately to sales and marketing (one comes before the other). In Factory Banking, the Blockchain makes the process simultaneous through instant automation – at the same time as the manufacturing process is happening, a value configuration of the Blockchain is ascribing automatic market demand to the resultant product. But that is no big surprise, in a way. For factories are what’s needed in a world where there are so many “things” you can’t keep up, after all. In the same way, The Internet of Things can only get underway with the rise of Factory Banking. 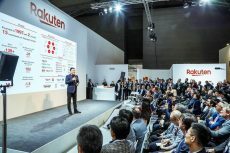 Note: This is a special feature exclusive to the site preceding a speech being made on the same topic by Coinspeaker’s Editor-in-chief Daniel M . Harrison at the Inside Bitcoin’s conference on May 14th in Hong Kong. Harrison is also the author of the new book named “Butterflies: The Strange Metamorphosis of Fact & Fiction In Today’s World.” It is being reprinted exclusively here for Coinspeaker’s audience. Butterflies is available on Amazon.